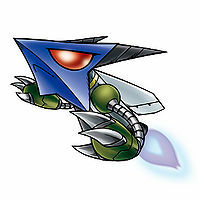 A Machine Digimon with a missile for a body. 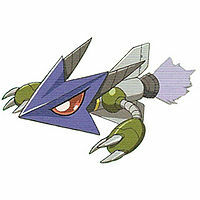 The moment it evolves into Missimon, its missile is ignited and sends it flying non-stop until it further evolves into another Digimon. While it is able to adjust its flight speed to some extent, it is unable to stop moving as it will fall if it does not maintain a sufficient flight speed. 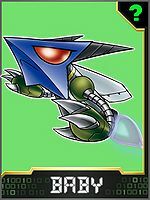 It can utilize this speed to do a body tackle (Missile Crash), sporting great destructive power, but this attack almost never hits its target due to Missimon's sub-par control. n., Short for Missile 「ミサイル Misairu」, which is a projectile. Anime/Manga Digimon Next: "Commandments of Terror!" Missile Crash  ミサイルクラッシュ Misairu Kurasshu Using its speed, it rams powerfully into the enemy. Many Missimon are part of the Bagra Army. Missimon is available as a Digimon Medal. Evolves from Bommon. Can evolve to Commandramon, Dracumon, Gizamon, Hagurumon, Penmon, or Tentomon. This page was last modified on 18 October 2018, at 15:09.